When I was a little girl my mom used to make easter eggs using string and starch. 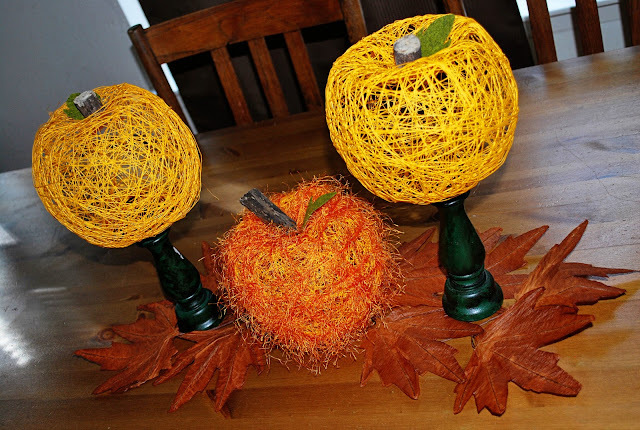 This week I decided to try making some string pumpkins since you might think I was a little crazy posting Easter Eggs right now. It worked great so I decided to share them with you. Do you want to make some of these? 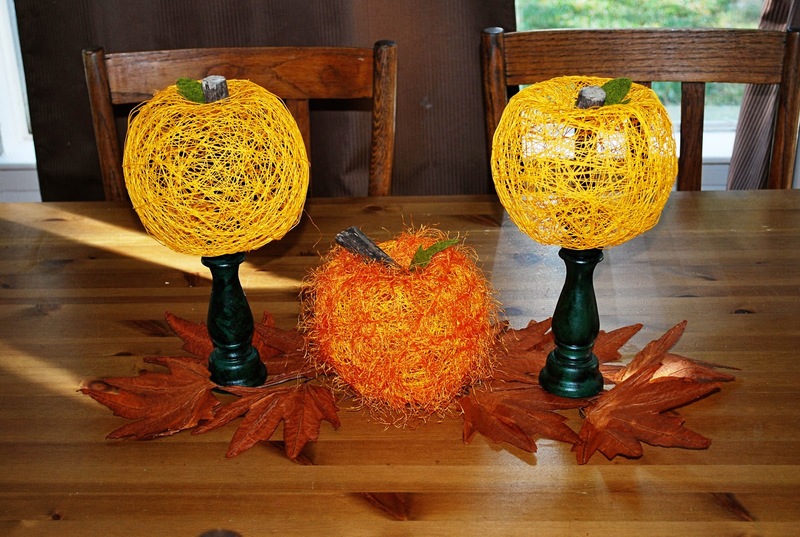 You will need balloons (one per pumpkin), white glue, water, foam craft brush or paintbrush, and crochet yarn. That’s all. I could only find a yellowish orange crochet yarn but I didn’t let that stop me. 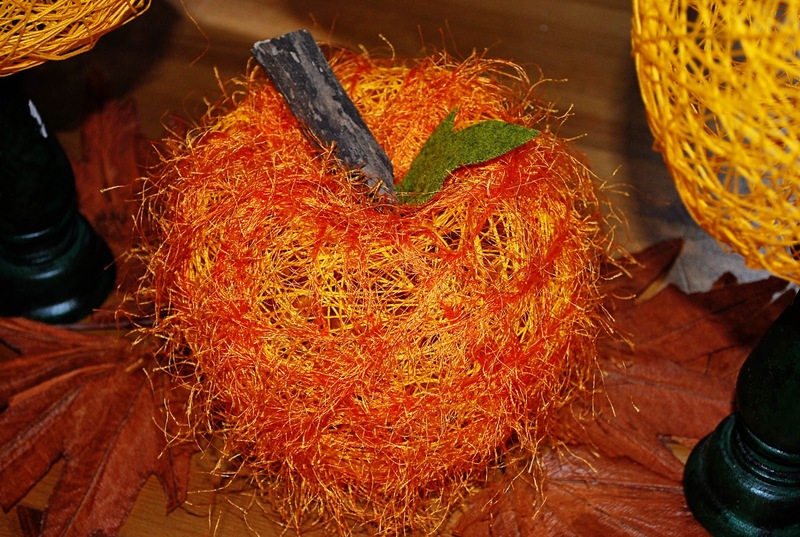 I also found a fuzzy thread on clearance that I used on one pumpkin. First mix glue and water in a 3:1 ratio. It should be like a thick soup. 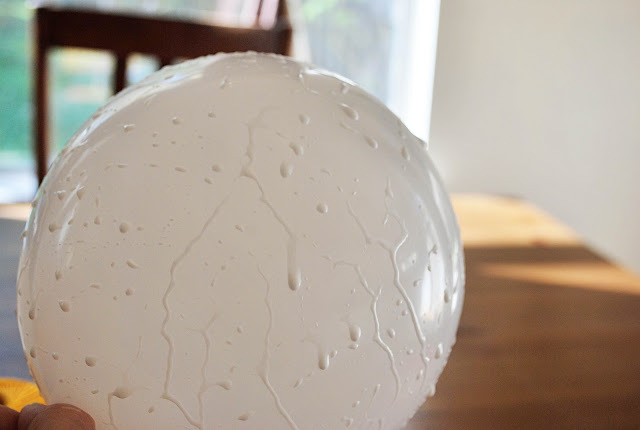 Use the glue to coat the entire balloon surface. Slowly wrap the string around the balloon. Keep wrapping, occasionally patting the entire surface of the balloon and string with more glue. You need to pat so you don’t pull the strings off the balloon. 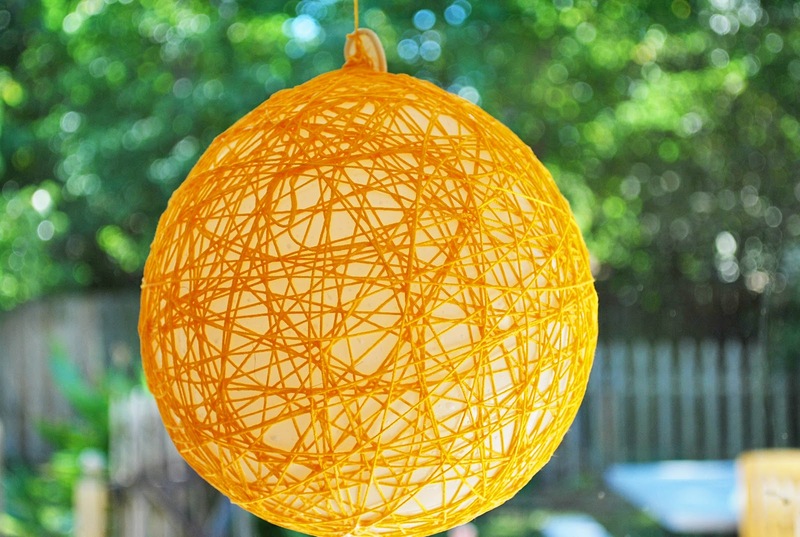 Then hang it up to dry by tying a string around the balloon knot. Now repeat to make more and learn how fun it is to take pictures of floating orange orbs. 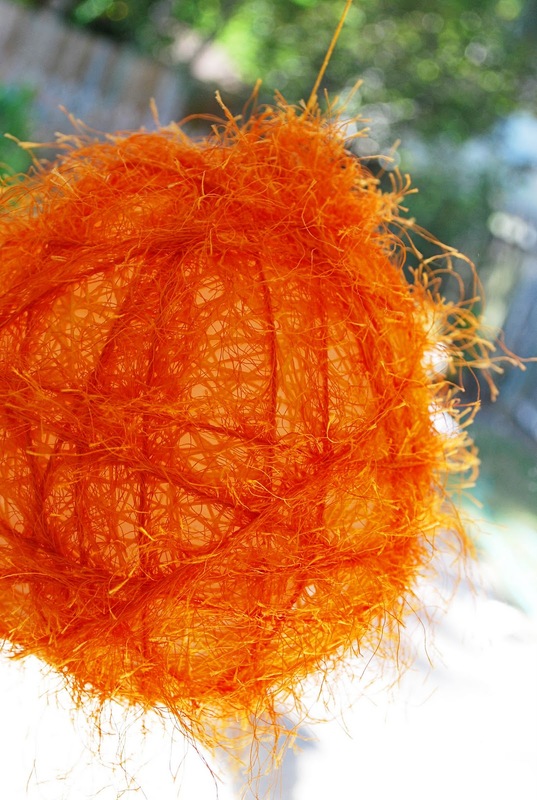 If you want to make a fuzzy pumpkin than you need to complete all the above steps including hanging it up to dry. While it’s hanging up, give it one last coat of the glue/ water mixture. If you look at the fuzzy string closely, there is one side that is actually fuzzy and one side that is just a braid. 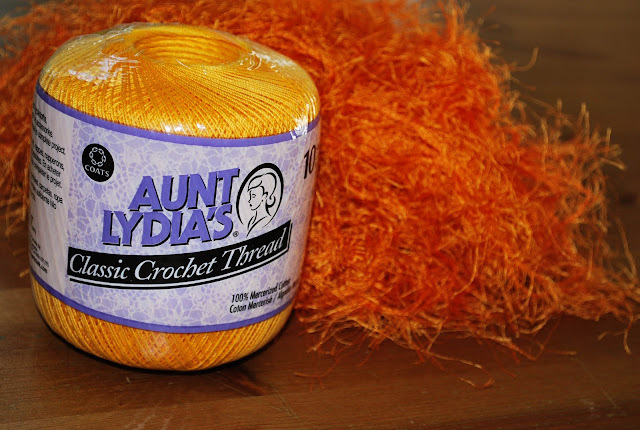 Wrap the braid side around the pumpkin several times but do not reapply any more glue because then you will glue down the fuzzys. Just do a couple of passes, don’t go too crazy or it won’t have enough glue to hold it. Let it dry. 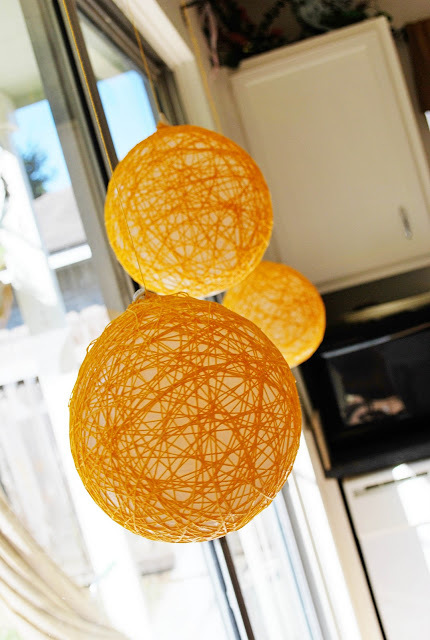 Let all the balloons dry overnight and then using scissors, snip the top of the balloon by the knot. 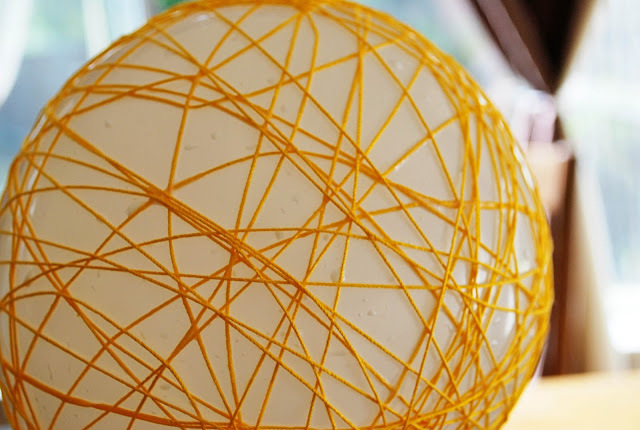 As the air leaves the balloon, it will pull away from the yarn leaving you a perfect sphere. Pretend you see a photo here. Pull the balloon out of the top and you’re almost done! 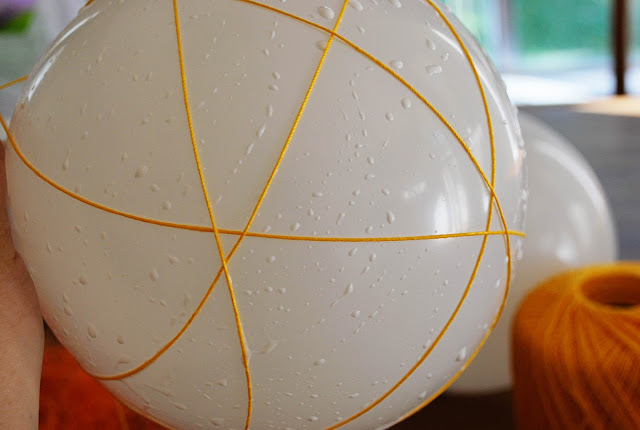 Now to make the pumpkin shape, just lightly push the top and bottom inside the sphere until you have a pumpkin shape. It should hold on it’s own. 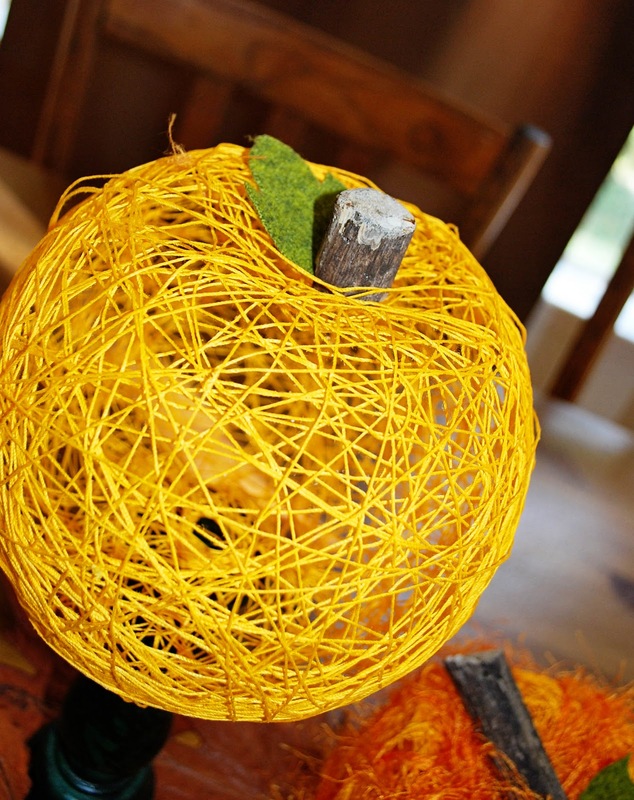 You could also add a felt pumpkin face for halloween using tape and then gently remove it for thanksgiving. I love the double duty crafts. Go make pumpkins! No dirt, watering, or waiting for months required. Don’t forget to follow along for more tutorials! You can find me on Facebook, Twitter, Pinterest, or subscribe via Email or RSS feed! La la la LOVE this!!!! The fuzzy pumpkin is too cute!! I am going to try this too!!! This is a great idea! They turned out so cute! I might have to try this! We do this every Easter to make eggs, I don't know why I've never thought of it for pumpkins before! And I love the fuzzy one! So cute! I want to make some of these!!! I love these!!!! Great job! these are seriously SO cute! I want to make them so bad! I love them! Wow. I especially love the fuzzy one! I hope we can find some time to do these this year! Very cute. I want some. So very cute and clever! Thanks for the how tos! Oh, I remember using this technique when I was young! How fun to reminisce. Your pumpkins turned out way cuter than any hot mess we ever made as kids, but it sure was fun! This is such a fabulous idea, so well done too…looks like it could have come straight from a high end store. I can't wait to make some…especially the fuzzy ones…LOVE that! Ok, that's totally genius! And good instruction! Having a giveaway and would love for you to stop over and get entered!! Adorable! I'd love to give these a try! These are AWESOME~! I love the little fuzzy one!